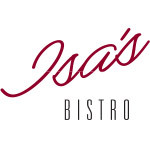 Located in the heart of downtown, Isa’s Bistro strives for the perfect combination of a unique setting, great service, & culinary excellence. Our location offers both outdoor patio & indoor dining, which will give you front row seats to the unmistaken vibe that has made Asheville famous. Executive Chef Duane Fernandes brings his seasoned culinary finesse to the table preparing cuisine that is innovative, seasonally inspired & contemporary American.